In the stack of magazines collecting dust next to my bed there are many old Christmas issues. Every year at this time I go through them, reading for the hundredth time about how to make the perfect Christmas dinner, diet in time to fit into my party dress, decorate my tree and make my own Christmas cards. None of which I ever really have the intention of doing, but I’m under the impression that reading about it somehow awakens my “season spirit”. The main mission of these magazines seems to be “to keep Christmas simple”. 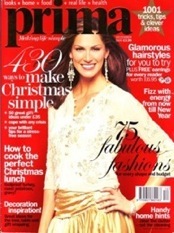 My 2005 issue of Prima has no less than “430 ways to make Christmas simple” written on the front page. The year after, 33 more ways apparently showed up. Oh yes, the 2006 issue of Prima offers “463 ways to make Christmas simple” on the remarkably similar cover. It’s not that I don’t want to plan ahead. Every year, a few days before Christmas when I’m all stressed out about the things I still haven’t done (like presents…), I promise myself that next year I’ll do better (I could hardly do worse). It never happens, because as my son said today (about something entirely different): “We’re always eaten by time”. And in the end, it doesn’t matter. Christmas has never been a failure because I didn’t make my own pudding or because I wrapped my presents in newspaper, 10 minutes before putting them under the tree. As for the dinner, well I have to admit, we spend Christmas with my parents so no worries there; my mother’s the best cook in the world. The best way to make your Christmas simpler is probably to stop comparing it to the ones pictured in the December magazines. Although even they seem to show a sense of humour nowadays. Guess what Prima’s front page advice for 2009 is? “Relax, it’s Christmas”. Now that’s funny.